Casio has unveiled a new addition to the MT-G line of G-SHOCKs. It has Bluetooth connectivity so as to maintain accurate time via a dedicated phone app. This new 'bright red' MT-G is rated for 200M water- and shock- resistance, as well as its maker's 'tough' solar technology to stay charged. Casio has launched a new variant of the MT-G G-SHOCK series. These watches have Bluetooth connectivity so as to maintain accurate time via the G-SHOCK Connected App. This new timepiece has a fresh color theme, with a bright red band made of urethane. This watch - the MTGB1000B-1A4 - is resistant to water ingress for a maximum of 200 meters deep. 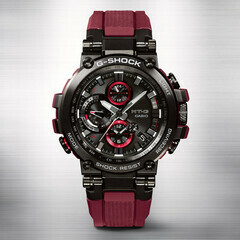 It also has Casio's Triple G Resist, for shock, vibration- and centrifugal-force resistance. It also has the company's "tough solar" charging mechanism, and a sapphire-crystal panel for scratch protection. In case Bluetooth fails, the new MT-G also has Two-Way Time Sync technology, which means it can also keep time via Multi-Band 6 Atomic technology. It also has a range of typical Casio properties, such as a Dual Dial Display, Super Illuminator LED Light, a stopwatch and countdown timer, daily alarm support, a full auto calendar and world time in 39 time-zones and 27 cities. 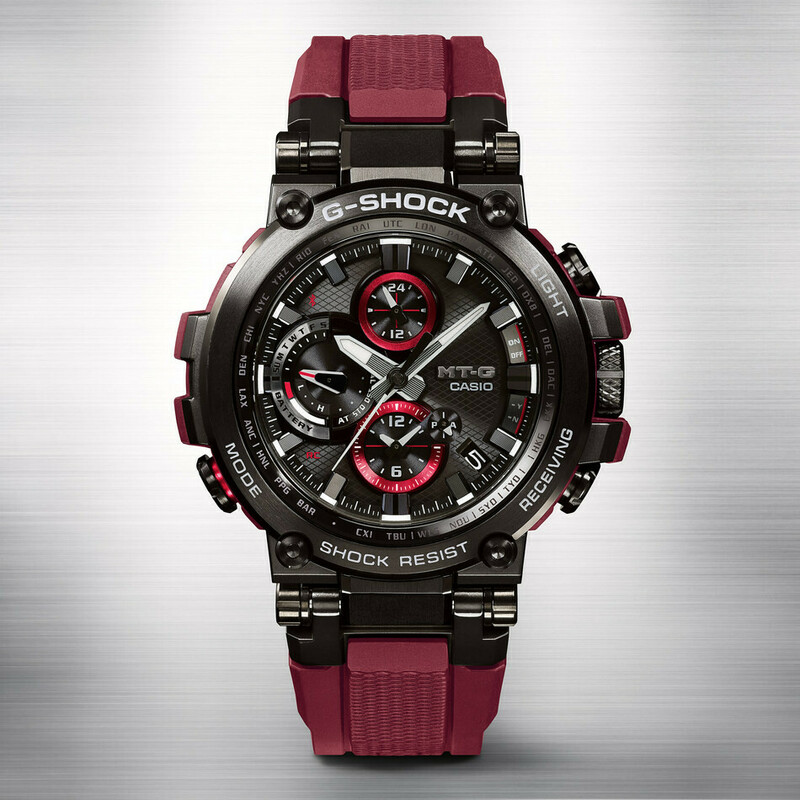 The new red G-SHOCK MT-G will be priced at US$900 on release, and is to be available through high-end watch shops in many regions, or, alternatively, on gshock.com.